There are those who feel that reporting on issues like this brings pleasure, well, it truly doesn’t. Billy Graham was someone I had looked to as an example and someone I greatly admired in Christ. There’s little doubt that Billy Graham came on the scene as someone who preached the historic orthodox Christian faith with power. But sadly, as you’re about to see, this would not continue as somewhere along the line Graham would apparently choose the role of “religious icon,” a musty old mantle passed to Rick Warren. Through the years of research here at Apprising Ministries troubling quotes and questionable associations he’d been making kept coming up. Finally, I had no choice but to conclude that Billy Graham has been compromised for years; and it continues. For example there’s Billy Graham Endorses Mitt Romney BGEA Website Removes Reference Calling Mormonism A Cult; and you’ll see below that his sinful ecumenicism with the apostate Church of Rome is beyond question. [Graham said]: ‘the three greatest menaces faced by orthodox Christianity are Communism, Roman Catholicism, and Muhammadism,” which we know is Islam today. The sad thing is that having made that very commendable statement he then subsequently proceeded to retreat on all fronts. There’s no basis for fellowship between the Christian and the Roman Catholic Church. Yet below you’ll see an example of Billy Graham doing just that; and worse, actually sending people to Roman Catholic Churches. The following comes from “His Eminence” Cardinal Roger Mahony, Archbishop of Los Angeles. 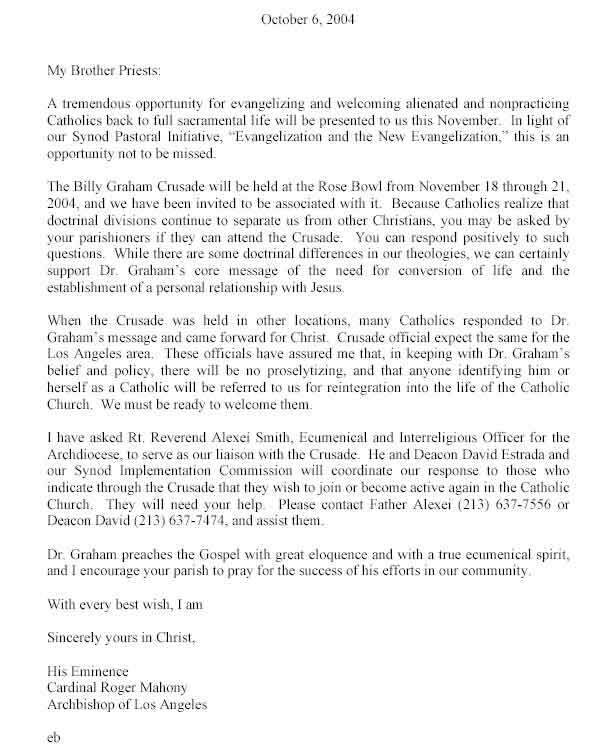 Notice Mahoney informs us that this sending people to apostate Roman Catholic Churches with their false gospel is Graham’s own personal “belief and policy.” In closing this, for now, you are about to see Billy Graham even tell you that someone can love Christ and know Christ and not even be conscious of it. Salvation by osmosis. This has certainly leaped from Aristotle to the [Roman] Catholic Church into evangelical Protestantism. Now we have a kind of Protestant viewpoint that says Muslims and Hindus and whoever are going to be in the Body of Christ, in the Kingdom, in Heaven, with salvation whether they ever get a Bible or whether they ever hear the Gospel or whether they ever know about Jesus Christ. The Billy Graham organization affirmed that this position is the same as the one articulated in an article in Decision magazine which Billy wrote in 1960, so this is not something new. Billy Graham truly has been compromised for many years.